Passengers in Leeds await the arrival of a service to Manchester. Just 29 per cent of services have been on time at both York and Huddersfield since the botched rollout of a new national rail timetable on May 20, according to data from performance tracking website On Time Trains. Sheffield railway station has been among the Yorkshire stations beset by problems in recent months. The figures - combined with 2,130 cancelled services at York (three per cent of the total services) and 1,641 cancellations in Huddersfield (three per cent) - mean the two stations are the two least reliable large stations in the country to catch a train from. The Yorkshire Post says: Why is Chris Grayling still in post? 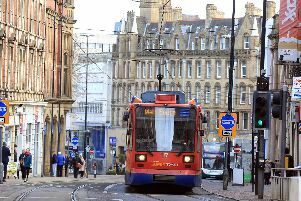 Sheffield has fared little better, with only 37 per cent of services arriving on time and 1,714 cancellations (two per cent), while in Leeds 43 per cent of services were on time, with 3,498 cancellations (two per cent). Many of Yorkshire’s smaller stations are even less reliable. Slaithwaite in the Colne Valley has the worst record in the country, where the number of on-train times - five per cent - exactly matches the number of cancellations. Almost one-quarter of services have arrived over 10 minutes late. Ravensthorpe, Batley, Dewsbury and Malton also feature in the bottom 10 performing stations from more than 2,600 across the country. Problems have followed the botched rollout of a new national timetable on May 20, which particularly affected Northern services and had a major knock-on effect on other operators. A report by the Office of Rail and Road in September found “systemic weaknesses in the planning and delivery of major network changes” - with the issues following on from a failure to complete rail electrification work in the North West over Christmas. Earlier this week, passengers in Slaithwaite and the nearby village of Marsden told The Yorkshire Post their hourly services were being “sacrificed” by TransPennine Express, with late-running trains between Leeds and Manchester frequently missing out their stops to make up time. Similar complaints have been made about services to and from Scarborough. Conservative MP Robert Goodwill, who represents Scarborough and Whitby, asked Transport Secretary Chris Grayling this week when passengers can expect “a return to normality” following a summer of delays. “Because of drivers’ hours, many trains have been terminated at York, leaving passengers waiting an hour for the following service, if it not also delayed,” he told Parliament. Labour MP Mary Creagh said it had taken one of her constituents six hours to get from Wakefield to Scarborough by train, “which, with a good wind, I could have achieved on a bicycle in the same time”. Mr Grayling said additional Scarborough services would be introduced “in the coming months”, while it is hoped an independent review will lead to improvements. Tory MP for York Outer Julian Sturdy said today: “As a regular user of York station, I can certainly sympathise with those who have endured poor levels of service. From speaking with constituents I am aware that there have been persistent problems with east-west journeys and I agree more needs to be done to address this. "However, it is quite clear that this does not solely reflect problems with the station itself. Whilst there are capacity issues at peak times this alone cannot explain the poor punctuality score. Huddersfield MP Barry Sheerman said service levels from the town’s station had been “absolutely dire” in recent months. Rail bosses today said they are working to improve services - and hope planned changes next month will make a contribution to that. A TransPennine Express spokesman said: “Since the May timetable change, some of our customers who use our north route have experienced disruptions to their journeys. We have been working with the rail industry since these issues came to light to try and rectify this and improve the reliability of our services. This is why the upcoming December timetable change will largely be a rollover of our existing timetable, so we can continue to focus on the resilience of services for customers.